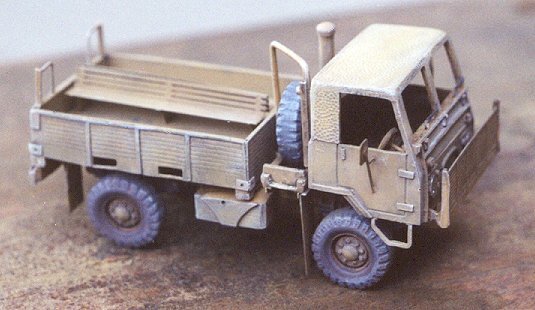 I have often lamented the lack of small scale kits of South African vehicles. 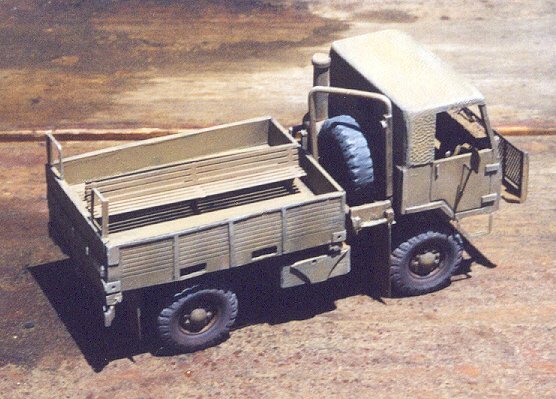 So I was obviously delighted to hear about a company in South Africa called BaxMod Models (named after Chris Baxter, the owner) who was producing a very impressive line of kits of trucks, armored personnel carriers, and even artillery pieces, of the South African army. 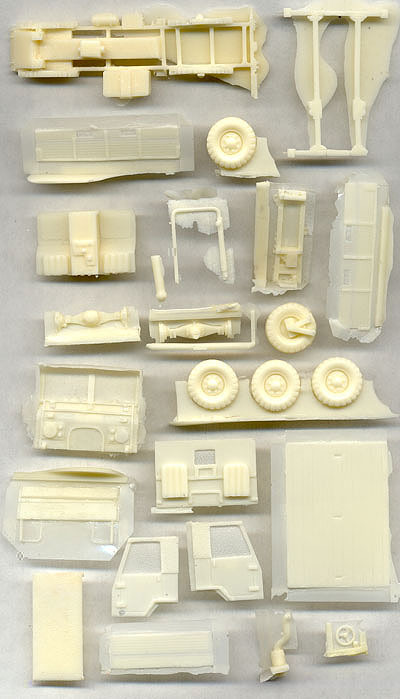 After making contact with Chris, he informed me that unfortunately his entire line of kits had been temporarily withdrawn from production, in order to make improvements to the molds. 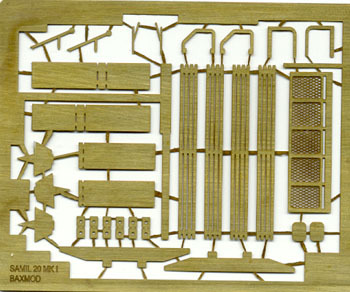 The first kit of his "new and improved" line is of the Samil 20 Mk. II truck. Chris' familiarity with the subject matter is obvious, having spent a lot of time himself in and around these vehicles. The resin parts are cast with the pour-method of casting, which produces a lot of flash, but most of it is paper-thin, and was easily cleaned up. The thicker stuff I removed with a saw and sandpaper. The master parts are very high quality, some are very delicate and extremely thin. There were numerous air bubbles throughout the kit, but they were all easily filled. The resin is high quality, and holds the detail very well. I am not sure if the resin was cured improperly, or if it was just a different type of resin than what I am used to, but many of the parts in this kit seemed almost rubbery, which in fact, helped considerably with construction, in that it was easy to simply bend warped parts back into shape. The truck is built in four sections: the cab, the spare tire/engine exhaust segment, the cargo bed, and the chassis. The cab was very straightforward in its construction, although the side pieces with the doors, were not quite long enough. I lined them up with the front of the cab, and added a small strip of styrene at the rear where it connects with the rear cab wall. The interior has some basic detail, such as seats, a dash board, steering wheel, and control console between the seats. The doors are molded shut, and careful cutting and re-working of the hinges would be necessary in order to model them open. There is a stippled pattern on the top of the cab meant to replicate the canvas covering. Careful drybrushing and weathering enhance the effect even more. There are foot rungs beneath each door, which are provided in photoetch. Based on the photo on the box top, I would guess that it would be better to make these rungs out of bent wire, and attach a flat step plate to them instead. It might also be beneficial to use wire or plastic rod for the mirror mounts, but the etched parts don't look too bad either. The protective screen in front of the cab, and windshield wiper blades are also done in brass, and look very good. It would have been nice to have some clear plastic included in the kit to replicate the windshield. The cargo bed was quite simple to put together, and the parts fit perfectly. There are two bent rods projecting up from the rear of the bed, which were molded onto the rear panel in resin. But they were so thin, that it would prove difficult to remove the resin flash without destroying them. Replacement parts are included as etched brass, but I didn't like the 2-dimensional aspect of the brass, so I replicated the parts with plastic strip and bent brass wire instead. 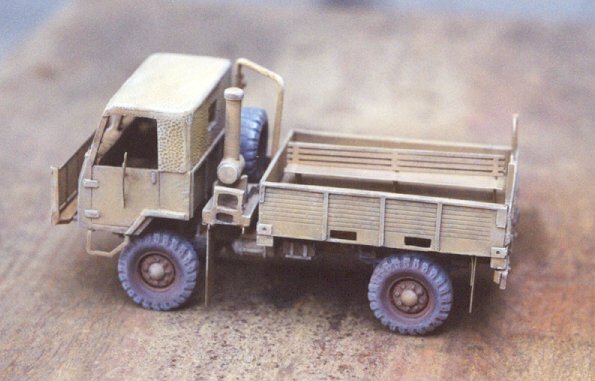 Also included as etched brass are the mud flaps, and troop benches for the cargo bed. One thing that I've found lacking in many of the best resin kits are decent instructions, but not so for this one. 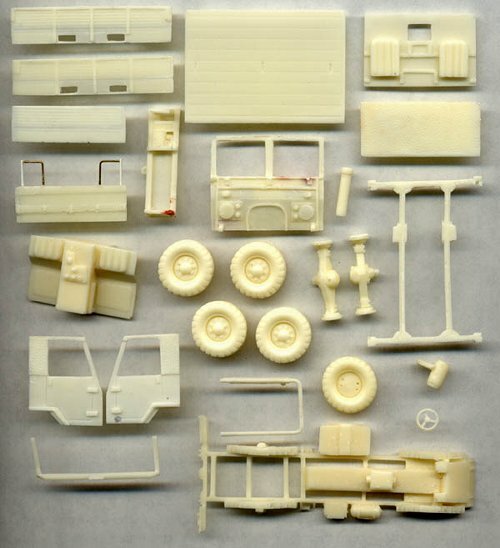 The parts layout and engineering of the kit are very good, and the inclusion of excellent instructions certainly helped in making the construction relatively hassle-free. 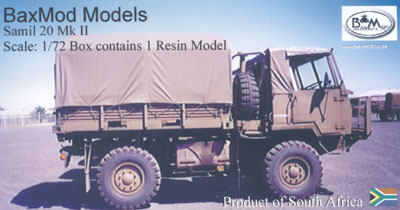 The color photo of the truck on the cover of the box provides an excellent reference for a vehicle not well documented in the U.S. Baxmod should be commended for including such excellent materials. 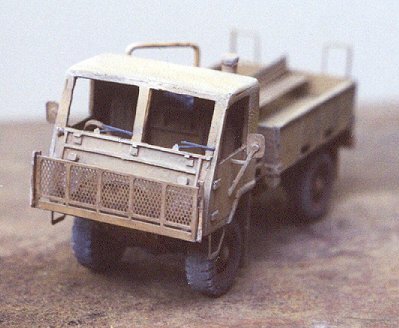 The instructions state that the truck should be painted "Dark Tan" so I used Tamiya Dark Earth, and gradually weathered the color through succesive layers of lightened paint, as well as pastel chalks. No decals are included, nor is any guide to markings in the instructions. This kit didn't fall together like many plastic models on the shelves today, but it shouldn't pose a problem to anyone familiar with building resin kits. I think it is a very interesting subject, which makes a unique addition to my collection. I greatly look forward to future releases of additional South African vehicles to accompany this Samil 20. Thank you very much to BaxMod Models for providing the review sample.